Here's Dova in her brand new Barbie glasses. She failed her last preschool eye exam in one eye, so we took her to the eye doctor to find out that she has astigmatism in her left eye, exactly like her brother and her mother. Is it possible that genetics are so specific that astigmatism in one eye can be passed on to exactly the same eye in both children? Apparently it is in our family. Unlike the rest of the family however, she is slightly far-sighted where we are all near-sighted. Brother Adam and dad Doug are slightly near-sighted and I am hopelessly near-sighted, although my vision has improved ever so slightly in my old age (check the links for all our glasses). I started wearing glasses at 7, not as early as these kids at 5 and 4, but I think early screening has improved. My vision got progressively worse until it hit about -12.0 diopters. But thankfully, glasses or contact lenses bring me back to 20/30 vision so I'm not legally blind. Basically, the only clear distance is about 4" away from my eyes. If I were to read without glasses, I would need to close one eye and move the book back and forth in front of the other. Forget trying to walk around outside my home without glasses or contacts! We were a little wary about getting glasses for this destructive girl. Two years ago, she managed to destroy two pair of glasses in the store when we bought Adam's first pair. Ripped the arms right off the hinges, torn right through the metal. She insisted on getting the pink designer Barbie glasses she saw in the store, where I was hoping to getting a cheap pair from Zenni Optical or 39DollarGlasses.com. I finally found the same glasses slightly cheaper at TheEyeDoctor.com and they came out great and included a cute Barbie case. We miss seeing Dova's big beautiful eyes, but she now has a different cuteness about her. I'm sure it's an adjustment but oh wow she looks adorable! She looks so adorable. 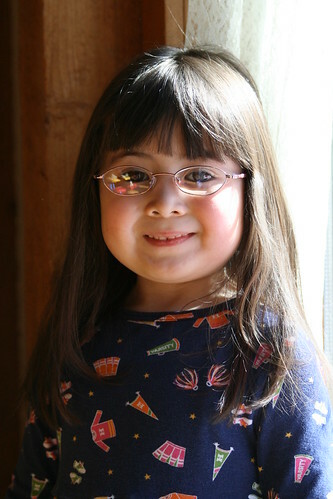 I had glasses when I was a little girl. OK, she is overly cute. To me, no one looks cuter than a kid in glasses. How adorable. I always wanted glasses as a kid. I would wear empty frames.. *sigh* yeah..